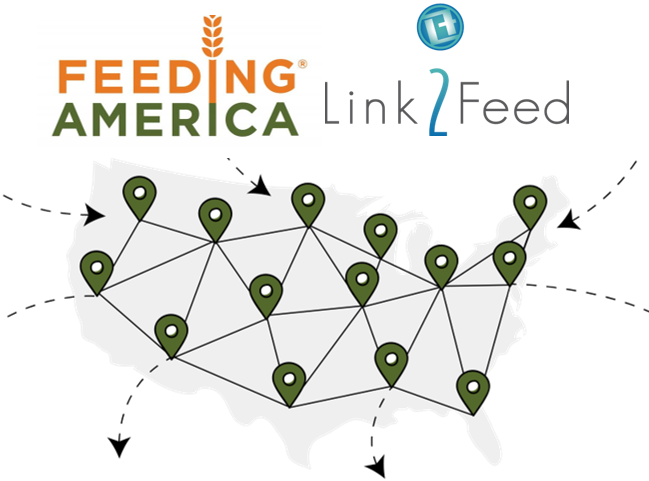 Link2Feed has been announced as the preferred technology provider for the Feeding America® Service Insights initiative; a project that will provide network food banks with a guiding framework to responsibly and effectively collect data to help improve programs for the people being served. The partnership will play a significant role in scaling the work and moving toward real-time data collection for Feeding America. “We are pleased to welcome Link2Feed as our first preferred service insights technology partner. Their steadfast commitment to reducing hunger through a high-quality software solution has helped Feeding America and many of our network food banks use technology to improve how we serve people who are facing hunger,” Erin McDonald, VP of Research. Link2Feed supported two of the service insights pilot programs, which were held at the Second Harvest Food Bank of Northwest North Carolina and The Capital Area Food Bank. Link2Feed currently works in-depth with 39 Feeding America food banks. We are also actively supporting state-wide rollouts in Arizona, Michigan and Oregon. Beyond the work with the Feeding America member food bank network, we also work directly with state-level government and have supported national and local hunger-relief organizations in the United Kingdom and Canada. Link2Feed has also been recognized as one of the top social impact organizations in the world; listed on B Corporation’s “Best for the World” list for two consecutive years. We will continue to work with Feeding America as a strategic partner in data analysis and will incorporate more technology in the fight to end hunger. “This announcement is a natural extension of our partnership with Feeding America and a culmination of four years of working together. We couldn’t have done it without the support of our food bank partners and their commitment to ending hunger- thank you for all that you do!” Link2Feed President, Emily Branton.